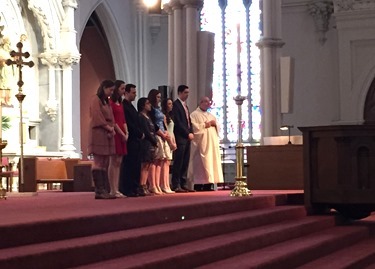 Each year at the Cathedral we have a beautiful celebration of the confirmations of university students organized by the campus ministries of the various colleges and universities in the archdiocese. And this year, it was held last Sunday. 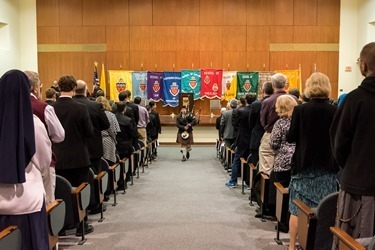 Many of the chaplains and other campus ministers — priests, religious and lay ministers —accompanied the confirmands and their families. 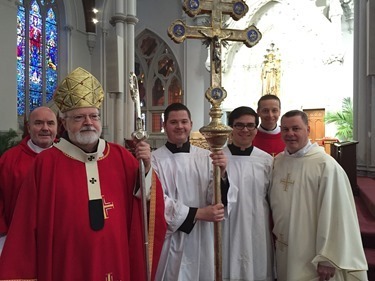 It’s always a wonderful event and we are very grateful to Father Richard Clancy and all those involved in this very important ministry of the Church. 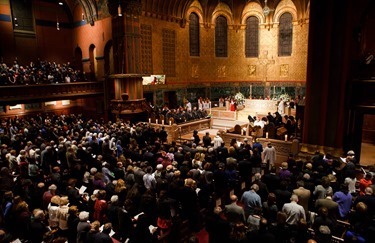 Campus ministry is critically important in Boston, where we have over half a million university students. 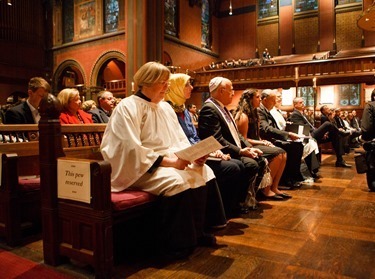 It is an extremely important service, not only for those students who are from the archdiocese, but also for those from all over the world who come to Boston to pursue higher education. 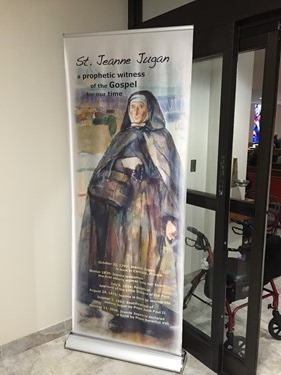 That afternoon, I went to Somerville to participate in the annual “Sharing the Vision of St. Jeanne Jugan” Fundraising Dinner to support the Little Sisters of the Poor. 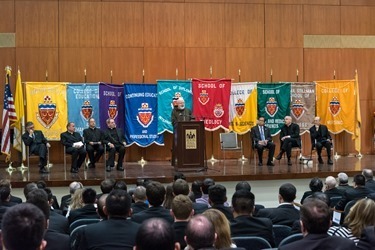 We began with a Mass attended by friends and benefactors of the community, followed by the dinner. 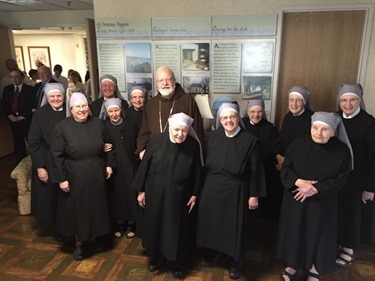 The Little Sisters of the Poor are an extraordinary presence in our archdiocese. 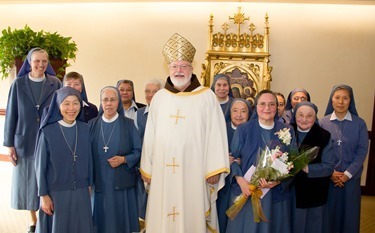 Theirs is such an important ministry of taking care of our elderly and infirm and they are a great witness to all of us. 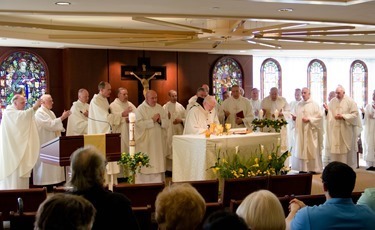 We are particularly grateful that they have been so good to the parents of several of our priests. 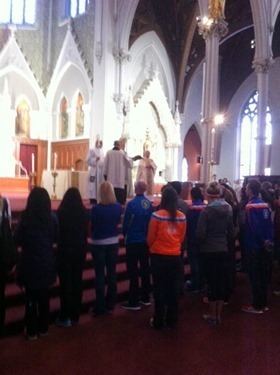 The next morning at the Cathedral, following the 11:30 Mass, we gave a blessing to those who were planning to run the Boston Marathon the next day. About 200 runners came up for the blessing. 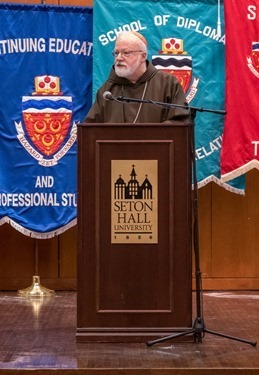 It was a great event, and we are very grateful to Father Kevin O’Leary, the rector of our Cathedral, who organizes it each year. 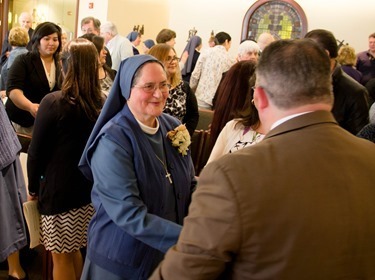 Sunday afternoon, here at the Pastoral Center, I was very happy to celebrate a Mass for the 50th anniversary of one of the Sister Disciples of the Divine Master, Sister Michelle, who is presently working at Regina Cleri. 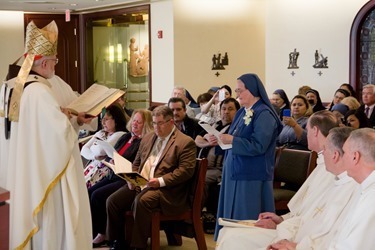 During the Mass, she renewed her vows. 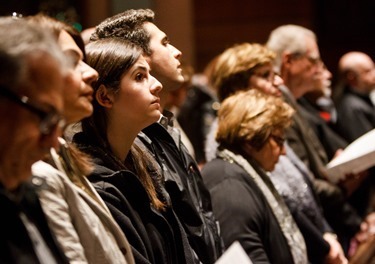 Many members of her family were able to join with us. 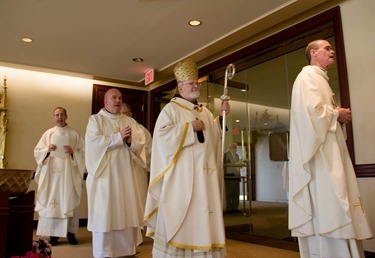 There was also a very large contingent of priests who were there for the celebration. 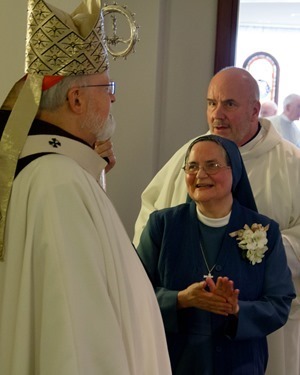 It was a wonderful tribute, not only to Sister Michelle on her 50 years of consecrated life, but also to the entire community. 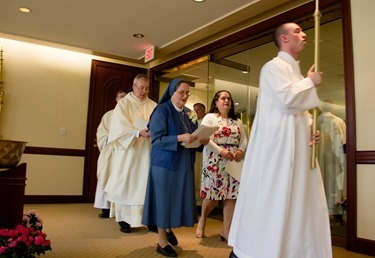 It shows the great affection that all our priests have for the Sister Disciples. From there, I went to South Boston for a celebration of three birthdays. 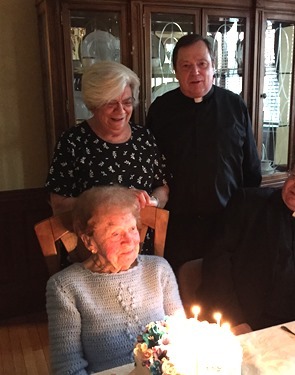 Certainly the one who deserves to be mentioned first is Sister Evelyn Hurley who was turning 100 years old! 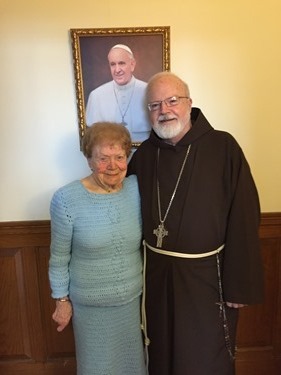 With Sister Evelyn, who looks splendid in her blue knit dress — which she made herself! 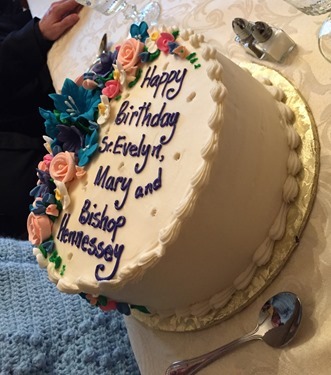 And also we celebrated the birthday of Mary Desantis, who is the cook there, and Bishop Hennessey. 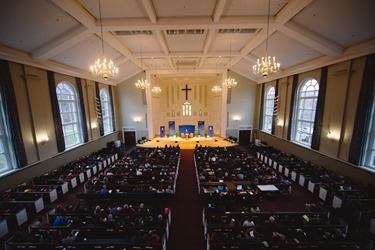 On Monday, I visited Gordon College, an Evangelical Christian college in Wenham, Massachusetts, for a lecture that was part of the celebration of their 125th anniversary. 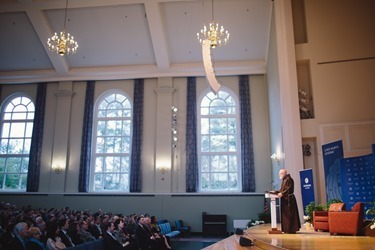 There were 1,000 people present at the lecture. College president Michael Lindsay introduced me and thanked me for my presence there. After the lecture there was a dinner for some of the leadership of the community, and also during my visit I had an opportunity to meet with the Catholic students who study at Gordon. 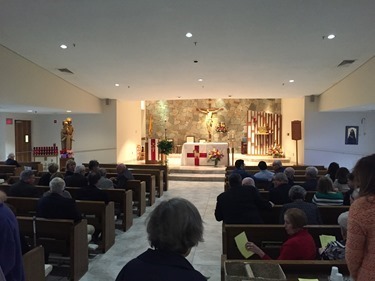 Though I wasn’t able to attend, that evening was the presentation of the Massachusetts State Council Knights of Columbus’ annual Lantern Award, which is always held on Patriots Day. 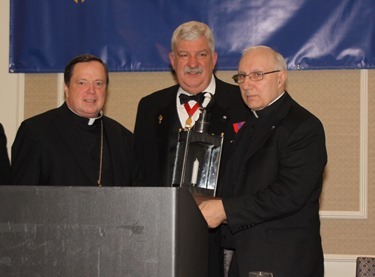 We are grateful for the extraordinary work of the Knights of Columbus and we were so pleased that this year they saw fit to give the Lantern Award to Father Joseph Baggetta. 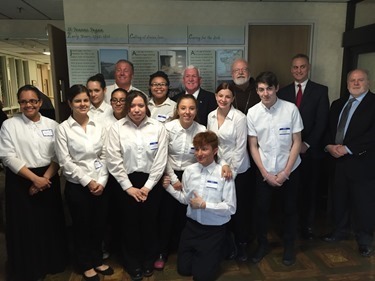 Father Baggetta does extraordinary work with the young offenders in our prison system, as well as his service at St. James Parish, which he always does with such generosity, and a spirit of priestly, pastoral love. 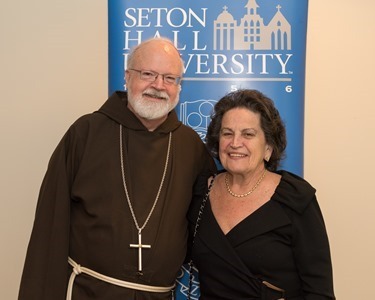 The following day, I left for Seton Hall University. 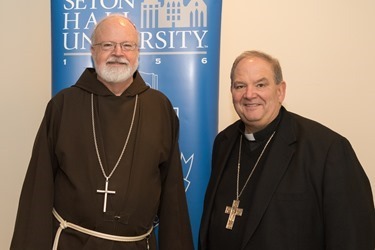 Seton Hall is one of the premier Catholic colleges in the country, and is located in the Archdiocese of Newark. 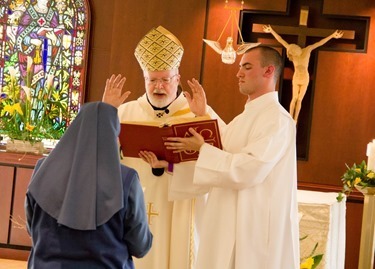 They also have a wonderful seminary there, Immaculate Conception Seminary. In fact, I was a visitator to that seminary many years ago. 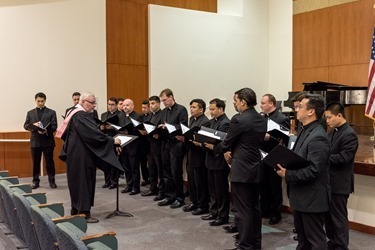 In Newark they also have a very large Redemptoris Mater Seminary, which has very generously supplied priests for many different dioceses, including our own. We began with Vespers at Immaculate Conception Seminary, where they presented me with an honorary Doctorate of Humane Letters. 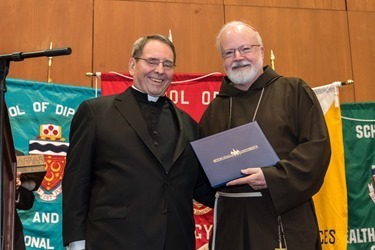 With Archbishop Myers as he confers the degree. 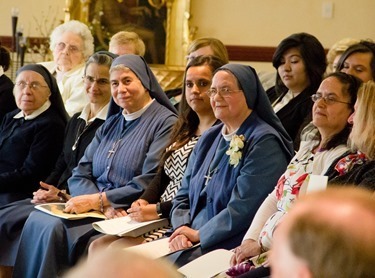 The event was to Mark the 10th anniversary of the Joseph Unanue Latino Institute that was funded by the Unanue family, and Doña Carmen Ana was present for the ceremony with us. 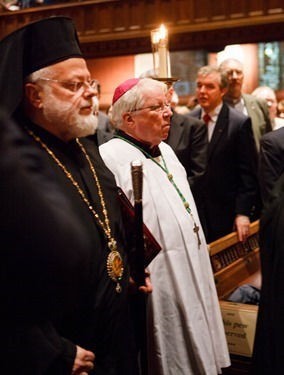 I was very happy to see Archbishop Hebda, who was also able to join us for the Vespers ceremony. 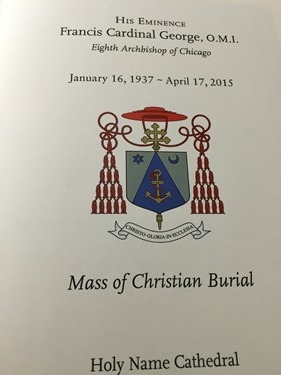 On Thursday, I traveled to Chicago to be present for the funeral Mass of Cardinal Francis George. 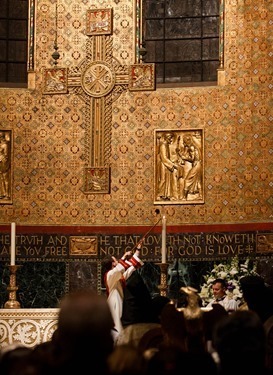 The funeral Mass was celebrated by Archbishop Blase Cupich and Archbishop Peter Sartain preached the homily. There were many cardinals, bishops, priests and, of course, hundreds of lay people present. 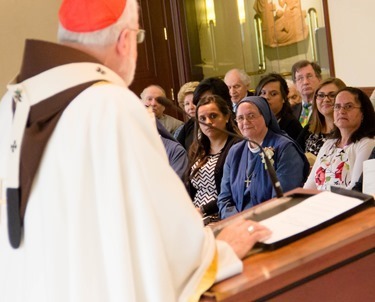 Cardinal George was an Oblate of Mary Immaculate, so we were also joined by their Father General, Father Louis Lougen, and the Final Commendation was given by Archbishop Robert Schwietz from Anchorage, who is also an OMI. 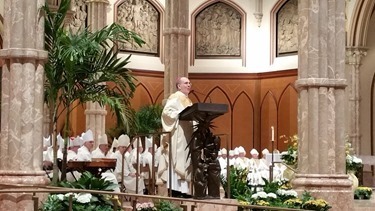 I was happy to be able to be present at the funeral Mass to offer my prayers for the eternal rest of Cardinal George’s soul and also to express our admiration for his fine service to our Bishops Conference and the people of the Archdiocese of Chicago. 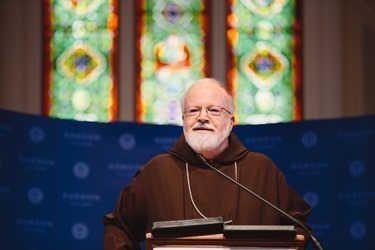 And, beyond that, he also rendered a great service on the world stage, where he made such a great contribution, particularly to Catholic intellectual life, because of his great learning and ability to teach the truths of the gospel in a very compelling way. 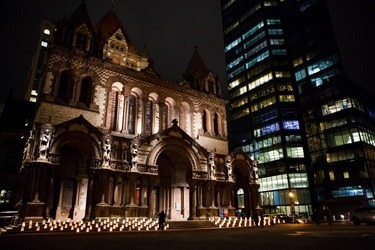 Because of the funeral, I was unable to be present for the Ecumenical Service held at Trinity Church in Boston yesterday evening to mark the centennial of the Armenian Genocide. 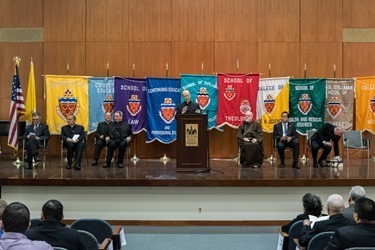 However, I was pleased that the archdiocese was represented by Bishop Arthur Kennedy, who took part in the program, as well as by Dr. Vito Nicastro from our Office of Ecumenical and Interreligious Affairs. 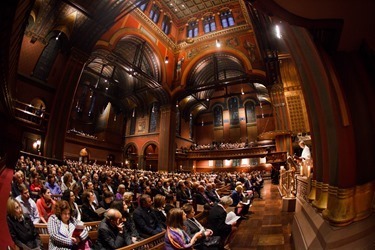 Of course, the Holy Father had celebrated a Mass April 12 at the Vatican to commemorate anniversary, and his characterizing the event as “genocide” certainly captured the attention of the world. Please know of my prayerful solidarity with you this evening. 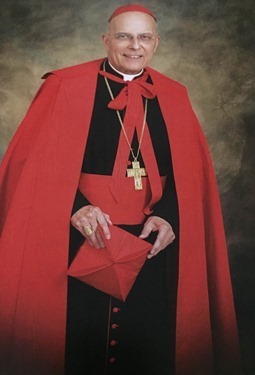 It was my intention to join you for this most important commemoration prior to being called to the funeral Mass for His Eminence Francis Cardinal George, Archbishop Emeritus of Chicago. 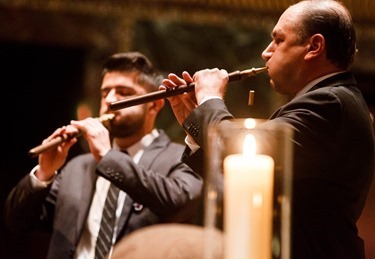 For the Roman Catholic Church, the meaning of the Armenian Genocide begins with great sadness and the recognition of the overwhelming loss of each human life taken from us in the Metz Yeghem, the Great Crime. Such evil extends beyond human vision. Where sight fails we must continue with different eyes, the eyes of faith. And in faith, we see how those we have lost are ours forever because their martyrdom ensures they await us above, in the one place we can never lose our loved ones. 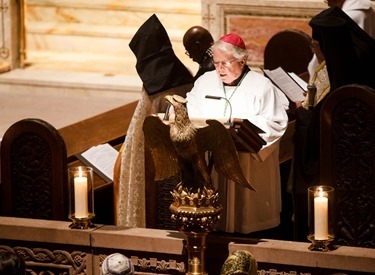 The Holy Father Pope Francis has said, it "was a true martyrdom of your people," and in Heaven the Catholic, Orthodox, and Protestant martyrs are already enjoying the full communion we Christians on earth still seek. There is no division among them. Therefore, they are the saints not just of some of us, but of all of us. Their Lord is one, their witness is one, their blood is one. My dear brothers and sisters, we must honor the martyrs and never deny the horrors they endured. We must never forget the mothers who encountered a contemporary experience of Herod, killing the innocent, from whose mouths "a voice was heard in Ramah, weeping and lamentation," the fathers, the elders, the orphans and the children who gave their lives because they would never forsake their families or their faith. We owe them unity, to stand as one for their Lord. 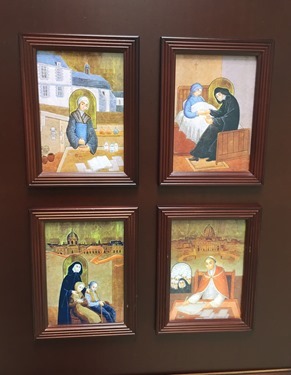 Since the martyrs are like our elder brothers and sisters in the Christian family, the first duty we owe to them is to draw the family together. · We owe them our witness, to stand as one for the message they sealed with the ultimate testimony. We owe them our voices to carry on their song. We honor and are indebted to all the martyrs of our churches. But to the martyrs of 1915 we also owe the full recognition of the systematic murder and assassination of identity that is genocide. As Pope Francis has said, "Concealing or denying evil is like allowing a wound to keep bleeding without bandaging it." There can be no more denial. 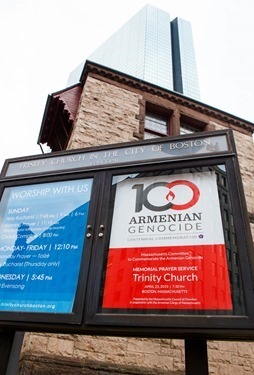 The attempt to take not just persons, but an entire people, not just individuals but one of the civilizations of humankind, is the Armenian Genocide. 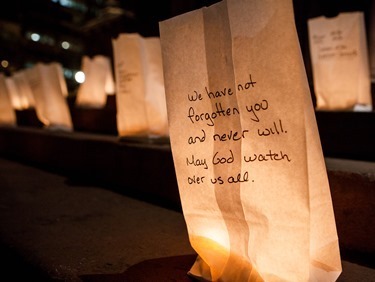 We owe these martyrs the commitment to stand against all genocide and crimes against humanity, especially those being perpetrated against Christians throughout the world these very days. We owe them our help in rebuilding the churches and the faith, the culture and the civilization of Armenia, the first Christian nation since 30I AD, a gift forever to all peoples but especially a gift to the Body of Christ. For your spiritual wealth, for the lived faith of 1700 years, for the wisdom of St. Gregory of Narek, Doctor of the Church, we owe our full spiritual esteem. Ultimately the genocide was a failed attempt. 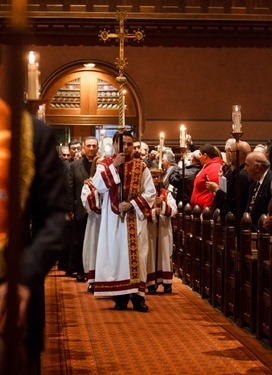 This evening we gather to give witness to and to celebrate the living, vibrant, growing heritage of Armenian spirituality, holy tradition, and faith which is a treasure for the Church of Jesus Christ everywhere and forever. May the Lord bless us, strengthen the bonds that unite us and lead us forward to build up the Kingdom of God in our world today.